Elevations in blood glucose levels are sensed in pancreatic ß-cells, which respond through a complex signaling pathway involving mitochondrial-dependent glucose metabolism1. The culmination of this pathway is the mobilization of intracellular insulin-loaded vesicles that fuse with the cell membrane releasing their contents into the bloodstream, which is referred to as glucose-stimulated insulin secretion (GSIS)1.Blood glucose normalization is then facilitated by insulin responsive target organs like skeletal muscle, adipose tissue, and the liver. When insulin engages the insulin receptor on the cells in these target tissues it signals the mobilization of the GLUT4 glucose transporter, which is actively shuttled to the plasma membrane thereby allowing the uptake of glucose from the blood2. Chronic high blood sugar (hyperglycemia) results in a state of glucose toxicity with concomitant lipid toxicity (dyslipidemia) that can lead to the development of Type 2 Diabetes (T2D). The incidence of diabetes continues to rise and in 2015 there were an estimated 415 million people affected worldwide3. The factors leading to persistent hyperglycemia in T2D are typically insulin resistance in the target tissues and impaired GSIS4. It is noteworthy that exercise is generally recommended in addition to changes in diet to help control blood glucose in patients with T2D. This approach takes advantage of the fact that skeletal muscle contraction drives glucose uptake through an insulin-independent mechanism5. The Rho family small GTPase, Rac1, plays an important role in both GSIS in pancreatic ß-cells and GLUT4 translocation to the membrane in skeletal muscle. The role of Rac1 in both processes appears to center around its ability to facilitate the trafficking of vesicles through changes in the cortical actin structure6-7. Loss of Rac1 function either through gene knockout in mice or siRNA mediated reduction in Rac1 levels attenuates GSIS6,8. The importance of Rac1 in GSIS has also been validated pharmacologically using small molecules that block Rac1 activation either directly or indirectly through preventing the association of Rac1 with its upstream activators known as guanine exchange factors (GEFs). The indirect inhibitors NSC23766 and EHop-016 inhibit the interaction of Rac1 with the GEFs Tiam1 and Vav2, respectively9-10. Figure 1. (Left) Schematic representation of GSIS with the role of Rac1 indicated in red. (Right) Insulin signaling in target tissues with the good/bad roles of Rac1 in red. Using these inhibitors in INS 832/13 cells and primary rat islet cells, glucose-induced Rac1 activation and membrane association was suppressed and GSIS was reduced11-12. Additionally, siRNA knockdown of Tiam1 or Vav2 in INS 832/13 cells also blocked glucose-induced Rac1 activation11-12, confirming a role for each of these GEFs in activating Rac1 in response to glucose. Moreover, the direct Rac1 inhibitor, EHT 186413, also blocked glucose-induced Rac1 activation and attenuated GSIS in INS 832/13 cells14. It is important to point out that although the focus of this discussion is Rac1 other small G-proteins are known to play a role in GSIS (e.g. Cdc42 and Arf6)15. As mentioned above, target tissues respond to circulating insulin by mobilizing GLUT4 receptors. This process requires Rac1 and its downstream kinase effector PAK1, except in adipose tissue where Rac1 does not appear to be involved in GLUT4 translocation16. It is also interesting to note that Rac1 plays a role in muscle contraction dependent glucose uptake17. 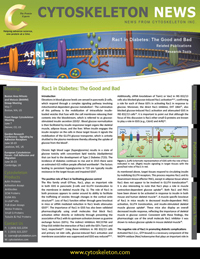 Both Rac1 and PAK1 have been shown to be activated in response to insulin in both mouse and human skeletal muscle18. A muscle specific knockout of Rac1 in mice results in decreased insulin-dependent PAK1 activation, GLUT4 translocation, and insulin-stimulated skeletal muscle glucose uptake7. These mice also display an overall decreased insulin response, reflecting the importance of skeletal muscle in glucose control. Consistent with these findings, the pharmacologic use of the small molecule Rac1 Inhibitor II was shown to reduce glucose uptake in mouse skeletal muscle19. Activated Rac1 (i.e. GTP-bound) is a necessary component of the NADPH oxidase (Nox) holoenzyme that plays an important role in generating extra-mitochondrial reactive oxygen species (ROS)20. It is known that glucose stimulates Nox-dependent ROS production and that a tonic increase in ROS is important for proper GSIS to occur21; however chronic hyperglycemia/dyslipidemia leads to the overproduction of ROS, in part through Rac1/Nox2, which promotes ß-cell dysfunction resulting in a reduction in GSIS22. The long term clinical complications of poorly managed T2D are manifold and include diabetic retinopathy, neuropathy, nephropathy, and cardiomyopathy23. Growing evidence indicates Rac1 is also involved in many if not all of the above pathologies, in large part, as a consequence of the Rac1-depedent overproduction of ROS. A few examples include the involvement of Rac1 in diabetic cardiomyopathy, where Rac1-dependent ROS production leads to cardiomyocyte apoptosis24. In the case of diabetic retinopathy, Rac1 has been shown to facilitate a breakdown in the blood retinal barrier, which is an essential step in disease progression25. The Rac1/PAK1 signaling axis has also been shown to be important for podocyte injury by promoting a process known as endothelial-to-mesenchymal transition (EMT) in the kidney26, which is a critical element in the development of pathological fibrosis that is associated with diabetic nephropathy. The observation that Rac1 has both physiologically and pathologically important roles in T2D implies that therapeutics directly targeting Rac1 to treat diabetic pathologies may experience challenges. In contrast, for Rac1 targeted drugs being developed for use in oncology there may be an added benefit if the drug alters the glucose uptake of a cancerous cell. At Cytoskeleton Inc., we have the research tools you need to study Rac1 (and other small G-proteins) and actin cytoskeleton dynamics in both live and fixed cells. Meda P and Schuit F 2013. Glucose-stimulated insulin secretion: the hierarchy of its multiple cellular and subcellular mechanisms. Diabetologia 56, 2552-2555. Foley K, et al. 2011. Endocytosis, recycling, and regulation of exocytosis of glucose transporter 4. Biochemistry 50, 3048-3061. Unger RH and Grundy S 1985. Hyperglycemia as an inducer as well as a consequence of impaired islet cell function and insulin resistance: implications for the management of diabetes. Diabetologia 28, 118-121. Goldstein MS, et al. 1953. Action of muscular work on the transfer of sugars across cell barriers; comparison with the actions of insulin. Am J Physiol 173, 212-216. Asahara A, et al. 2008. Rac1 regulates glucose induced insulin secretion through modulation of cytoskeletal organization in beta cells. Diabetes 57(supplement), A55. Ueda S, et al. 2010. Crucial role of the small GTPase Rac1 in insulin-stimulated translocation of glucose transporter 4 to the mouse skeletal muscle sarcolemma. FASEB J. 24, 2254-2261. Kowluru A 2011. Friendly, and not so friendly, roles of Rac1 in islet ß-cell function: lessons learnt from pharmacological and molecular biological approaches. Biochem Pharmacol 81, 965-975. Gao Y, et al. 2004. Rational design and characterization of a Rac GTPase-specific small molecule inhibitor. Proc Natl Acad Sci USA 101, 7618-7623. Montalvo-Ortiz BL, et al. 2012. Characterization of EHop-016, a novel small molecule inhibitor of Rac GTPase. J Biol Chem 287, 13228-13238. Veluthakal R, et al. 2009. Regulatory roles for Tiam1, a guanine nucleotide exchange factor for Rac1, in glucose-stimulated insulin secretion in pancreatic ß-cells. Biochem Pharmacol 77, 101-113. Veluthakal R, et al. 2015. Vav2, a guanine nucleotide exchange factor for Rac1, regulates glucose-stimulated insulin secretion in pancreatic beta cells. Diabetologia 58, 2573-2581. Shutes A, et al. 2007. Specificity and mechanism of action of EHT 1864, a novel small molecule inhibitor of Rac family small GTPases. J Biol Chem 282, 35666-35678. Sidarala V, et al. 2015. EHT 1864, a small molecule inhibitor of Ras-related C3 botulinum toxin substrate 1 (Rac1), attenuates glucose-stimulated insulin secretion in pancreatic ß-cells. Cell Signal 27, 1159-1167. Jayaram B, et al 2011. Arf nucleotide binding site opener [ARNO] promotes sequential activation of Arf6, cdc42 and Rac1 and insulin secretion in INS 832/13 beta-cells and rat islets. Biochem Pharmacol 81, 1016-1027. Marcusohn J, et al. 1995. The GTP-binding protein Rac does not couple PI3-kinase to insulin-stimulated glucose transport in adipocytes. Curr Biol 5, 1296-1302. Sylow L, et al. 2013. Rac1 is a novel regulator of contraction-stimulated glucose uptake in skeletal muscle. Diabetes 62, 1139-1151. Sylow L, et al. 2013. Rac1 signaling is required for insulin-stimulated glucose uptake and is dysregulated in insulin-resistant murine and human skeletal muscle. Diabetes 62, 1865-1875. Sylow L, et al. 2014. Akt and Rac1 signaling are jointly required for insulin-stimulated glucose uptake in skeletal muscle and downregulated in insulin resistance. Cell Signal 26, 323-331. Abo A, et al. 1991. Activation of NADPH oxidase involves the small-GTP binding protein p21rac1. Nature 353, 668-670. Pi J, et al. 2007. Reactive oxygen species as a signal in glucose-stimulated insulin secretion. Diabetes 56, 1783-1791. Newsholme P, et al. 2009. Insights into the critical role of NADPH oxidase(s) in the normal and dysregulated pancreatic beta cell. Diabetologia 52, 2489-2498. Shen E, et al. 2009. Rac1 is required for cardiomyocyte apoptosis during hyperglycemia. Diabetes 58, 2386-2395. Li Y-J, et al. 2015. Ras-related C3 botulinum toxin substrate 1 activation is involved in the pathogenesis of diabetic retinopathy. Exp Therap Med 9, 89-97. Lv Z, et al. 2013. Rac1/PAK1 signaling promotes epithelial-to-mesenchymal transition of podocytes in vitro via triggering ß-catenin transcriptional activity under high glucose conditions. Int J Biochem Cell Biol 45, 255-264.